WASHINGTON--The FCC today formally unveiled and delivered to Congress its national broadband plan, which calls for increasing wireless spectrum for mobile broadband as part of a much broader and complex effort to expand high-speed Internet access across the nation. Many pieces of the 360-page plan have been previewed over the past several weeks by FCC Chairman Julius Genachowski as the commission sought to gauge reaction to its proposals, some of which will require action and funding from Congress. The FCC's staff said the plan is revenue neutral, based upon revenue projections from spectrum auctions. Blair Levin, the former Stifel Nicolaus analyst and FCC official who served as the head of the commission's broadband task force, told commissioners that the plan is fluid. "This plan is in beta and always will be," he said, but noted that "evaluation is no excuse for paralysis." The commission has been developing the plan for a year, holding workshops and receiving input from industry, public policy experts and citizens. The centerpiece of the wireless portion of the plan calls for freeing up 500 MHz of new spectrum for mobile broadband in the next 10 years, of which 300 MHz between 225 MHz and 3.7 GHz should be made available within five years. The FCC reiterated the importance of scoring more airwaves for wireless. "If the U.S. does not address this situation promptly, scarcity of mobile broadband could mean higher prices, poor service quality, an inability for the U.S. to compete internationally, depressed demand and, ultimately, a drag on innovation," the plan states. The plan also argues for the need "to address other potential network bottlenecks that inhibit speed, including backhaul and other point-to-point applications." The FCC said a key element of freeing up spectrum would be to score 120 MHz from TV broadcasters. Under the plan, broadcasters would voluntarily exchange their spectrum for a share in the resulting revenues from the auction of that spectrum, an action Congress would have to authorize. "The voluntary, market-based reallocation should be implemented in a way that will have limited long-term impact on consumers overall, broadcast business models and the public interest, including the FCC's goals with respect to competition, diversity and localism," the plan states. "Moreover, the substantial benefits of more widespread and robust broadband services would outweigh any impact from reallocation of spectrum from broadcast TV." 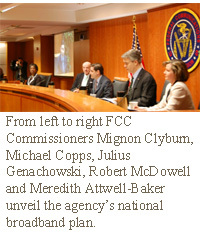 However, the FCC acknowledged possible alternatives. If the agency does not get authorization for such auctions, or if the auctions do not produce enough spectrum, the plan calls for the FCC to look for alternatives including a "transition to a cellular architecture on a voluntary or involuntary basis." Not surprisingly, wireless industry trade group CTIA said it is "extremely pleased" with the broadband plan's call for more spectrum. However, the National Association of Broadcasters seemed less so. "We are concerned by reports today that suggest many aspects of the plan may in fact not be as voluntary as originally promised," the NAB said in a statement. "Moreover, as the nation's only communications service that is free, local and ubiquitous, we would oppose any attempt to impose onerous new spectrum fees on broadcasters." The FCC said additional airwaves for mobile broadband also could come from Mobile Satellite Service, AWS and WCS spectrum bands. Another major element of the FCC's plan involves building a nationwide, interoperable, broadband wireless network for public safety--a reaction by the agency to communications troubles among first responders during the 9/11 terrorist attacks and Hurricane Katrina. The FCC's plan calls for a re-auction of the D Block of the 700 MHz band, and for Congress to allocate $12 billion to $16 billion over the next 10 years to help build out a network using the D Block. The D-Block commercial licensee or licensees will have to use a nationally standardized air interface, possibly LTE. The FCC also said "authorized state, local and federal public-safety users to have rights to roaming and priority access for broadband service on commercial networks subject to compensation." D-Block licensees must also develop and offer devices that work both on the D Block and the neighboring public-safety broadband spectrum block. Finally, the D Block licensee or licensees "should be subject to commercially reasonable buildout requirements." The commission "should also consider the use of incentives to promote additional deployment by the D Block licensee(s) for the benefit of rural citizens and for public-safety agencies." FCC Commissioner Robert McDowell, one of the agency's two Republican members, praised the work of the broadband task force. "Today marks the beginning of a long process, not the end of one," he said. McDowell noted that there are some aspects of the plan that are troubling to him, including the idea that broadband could be reclassified as a telecommunications service, which would give the FCC greater authority to regulate wired and wireless networks. He also said the commission's net neutrality proceeding--which is not specifically addressed in the plan, and which he sees as unnecessary--cast a shadow over the effort. Genachowski said the stakes for the commission are high, and that the plan places an "enormous responsibility" on the FCC, adding, "We must act and we will act with an urgency that meets the moment."